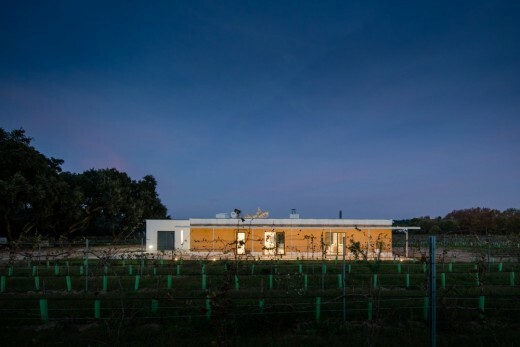 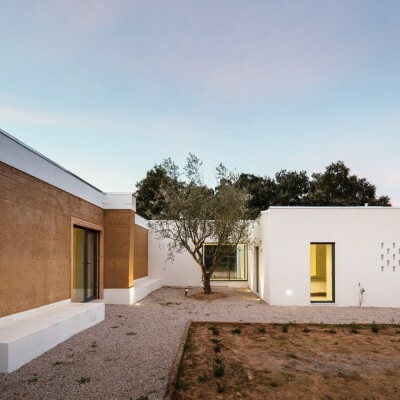 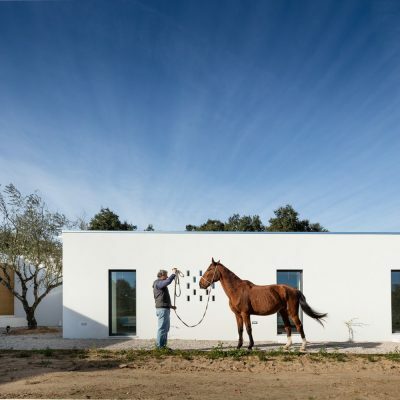 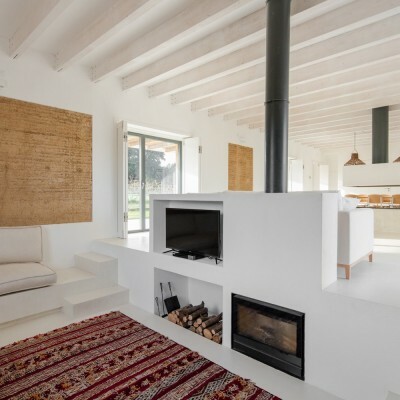 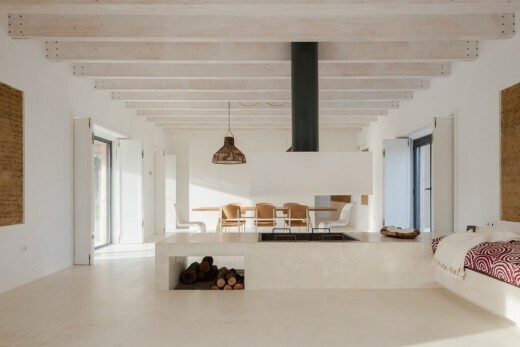 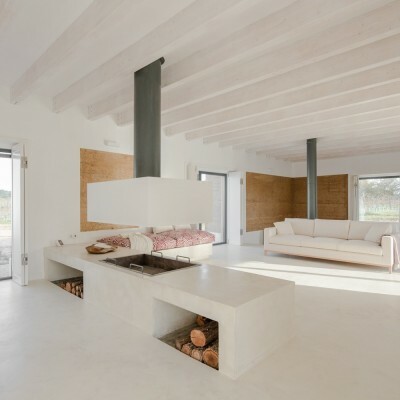 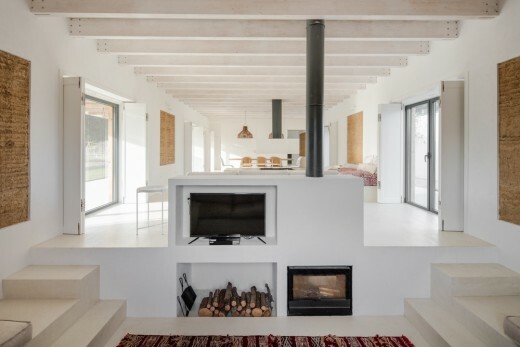 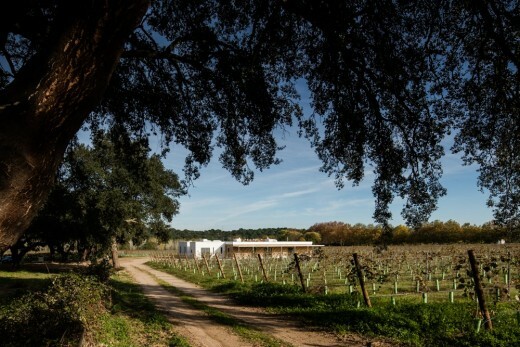 Implanted on a large agricultural estate, the house is built in the middle of the property’s vineyard on an almost flat terrain adjacent to a cork oak forest. 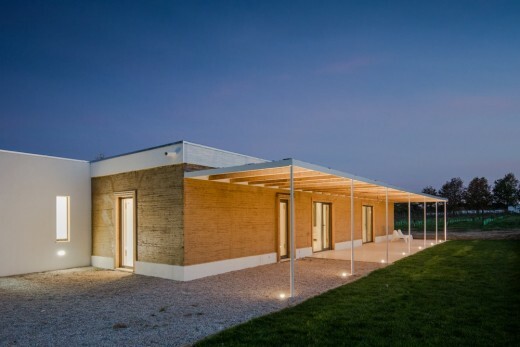 The calm and serenity of the surroundings welcomes the one storey building which tries to interfere as little as possible with the landscape by aligning alongside the natural elements that compose the peaceful backdrop. 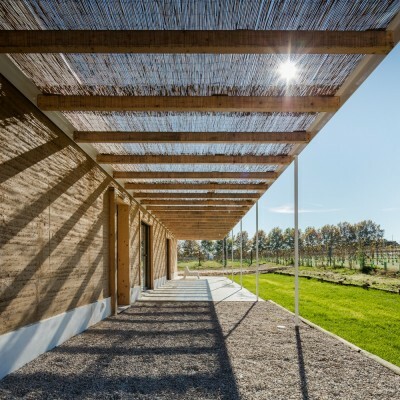 The common areas, confined to a Rammed Earth volume, communicate with the entire length of the outdoor terrace which functions as an extension of the living areas as well as bringing shade to the west façade. 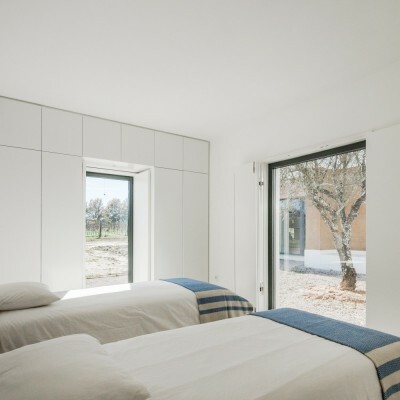 The two remaining volumes contain six suites, an office, a small guest bathroom, a guest bedroom and a storage area with direct access from the exterior. 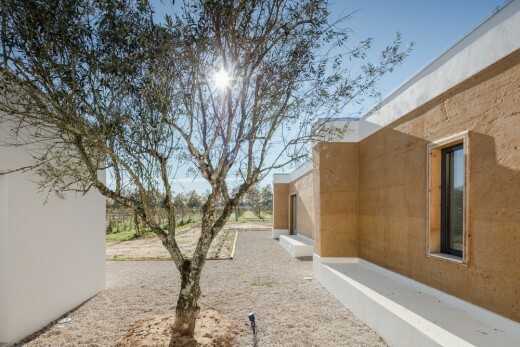 Two buttresses were introduced on the longer walls in order to improve structural behaviour; to ensure the resistance of the construction against tensile stress. 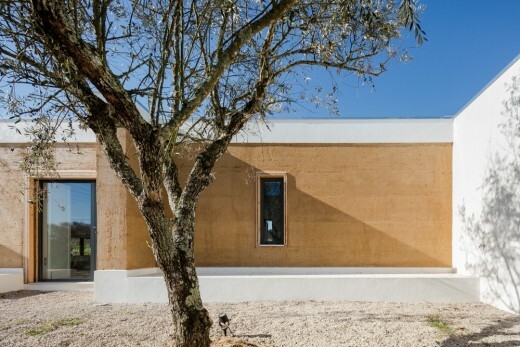 The Rammed Earth was reinforced with fibreglass mesh in-between layers and overlapped in all corners of the polygon. 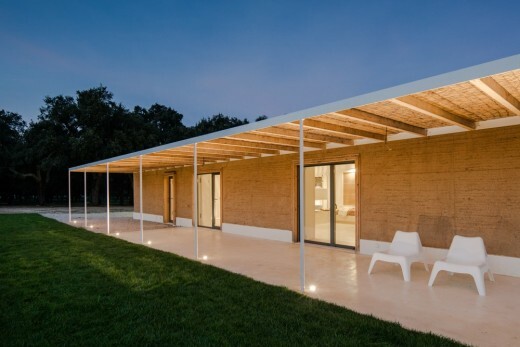 The introduction of a fibreglass mesh allowed the construction of continuous earth layers without vertical joints, enhancing the beauty of the material. 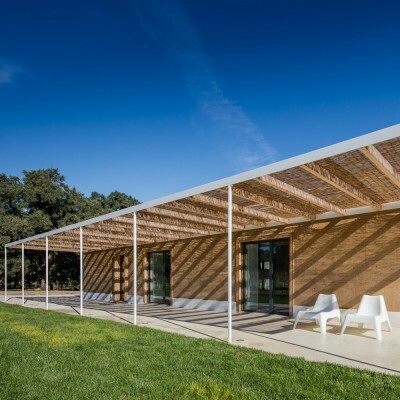 Combined with architectural option of a flat roof, the presence of generous openings required solutions that would overcome these constraints. 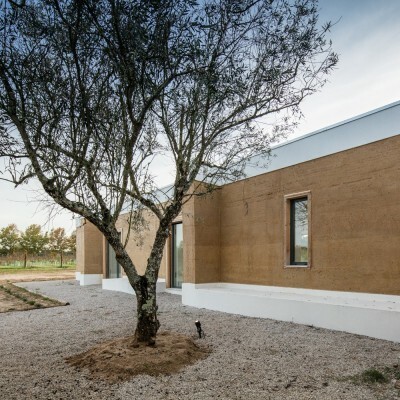 This was achieved using the actual doorframes made of laminated wood which act as a bracing element and as part of the formwork for the Rammed Earth. 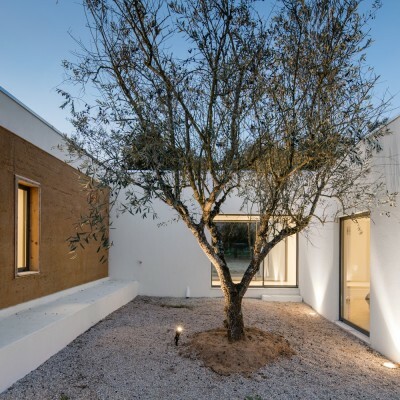 Finally, to preserve the earth’s appearance in the best possible way, a protective coating of water glass and casein was applied.